in the heart of Quebec. Experience nature at its best in the heart of Bellechasse! La Jolie Rochelle facilitates you easy access without sacrificing the high quality requirements in the development of its infrastructure. Located on the edge of the magnificent Rivière-du-Sud forty minutes from Quebec City, the site offers an atmosphere of relaxation and tranquility without compromise. Environmental, aesthetic and recreational tourism dimensions have been harmoniously reconciled in the interest of sustainable development of tourism. Its main mission is to serve the traveling camper offering a holiday destination or even a break on a journey between the central and eastern Canada. Its enchanting scenery that inspires the rest preserve the lack of structured activities and embarrassing proximity own more traditional campsites. A few kilometers from La Jolie Rochelle, multiple points of interest diversify the camping trip: circuit hike, bicycle, golf, summer theater, museum, the islands of Saint-Laurent, vineyard, horse riding, agrotourism, etc.. Happy New Year 2019 of camping! The booking office will opened the first of january. The last section of the road to go to Camping La Jolie Rochelle is now asphalted. 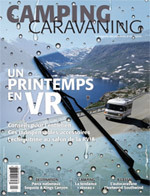 To read the article of Mr. Lio Kiefer from Le Devoir.com speaking of Camping La Jolie Rochelle, please click the link below. Second favorite camping of Quebecers according to the magazine “Camping and Caravanning.” See the special issue “My favorite camping”, March-April 2012.